If ever there was a number to gamble upon a huge wager it would be 7. Click here to play! It has been a lucky number throughout the centuries for countless kings, warriors, and gamblers alike. There are scores of casinos across the world that go by the name Lucky 7 so what better way to increase your chances of winning big than playing Lucky 7s slot machines today! 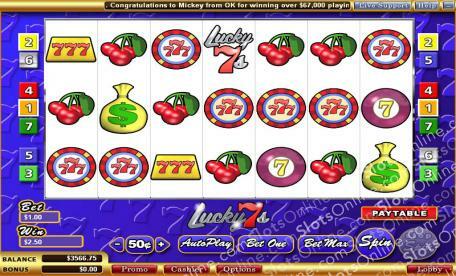 This 7-reel and 7 pay-line slot machine is simple to use and rife with opportunities for you to earn massive payouts. You can play on any or all pay-lines each time you spin, and if you manage to get 7 Lucky 7s symbols at once you will receive 2500 times your stake! Moneybags, gold bullions, betting chips, and cherries are all on the reels to help you win big every time you spin. Be sure to play today to see just how Lucky your 7s truly are!